The forest home of the Fairies it is said to mark the border between the fairy world and the 'human' world. This space is ruled by a single person and is full of teeming life. It is said to house some of the greatest mysteries of the world including a fountain of youth and a Sacred Tree which is said to bend only to the will of a chosen sovereign. A golden light appeared within the Fairy Forest to herald the arrival of three individuals, two being a young pair of Adventurers in the company of the Fairy Queen Dakini herself. One of these Adventurers was the ashen-haired lad Kou, who arrived in immediate awe of the forest surrounding them. Everything was so vibrant as the sun shined through spaces between the trees, and he simply couldn't put words to it. "Wow..." he said as he took a few steps around and admired the surrounding area. "I don't know what we're seeing, but... wow..."
"Wow is right!" Miki said, even she couldn't really put into words how to feel about this place they'd so recently entered. It was a vibrant green lush and warm. The whole place vibrated with magic, and the resilience of life. "Yeah, bet you do like it here. Fairy Queen's Forest is a place of life and nature. You guys are getting to see nature in its purest form. An interesting follow up to Dwargon... but I am sure you two can appreciate the change of pace..." Dakini said her normal voice returning as the golden orb disappeared from around them. She stepped forward her feet making contact with the ground for the first time and a surge of magic happening because of it. "Come along..." Dakini said, as if she expected the pair to follow. She'd lead them up into the trees to something which looked like a natural throne with golden flowers. While they walked along Miki took in the forest and chuckled as he remembered something else she'd found stunning. She nudged Kou and aimed to share with him what she considered a bit of pressing information. "Oh! I just remembered the man that taught me runes sounded like the Speaker for the Greybeards! It was awesome!~" she said in a hushed whisper. The girl was well and truly excited but as they made their way to the throne room she soon returned to the amount of awe the forest needed. After a few moments they would see Dakini seated in her sunflower like throne with the pair of them standing before her. "So, you two did what I asked as my Ambassadors... I'm surprised. You also quelled an entire war which is impressive. Technically keeping the invasion from spreading to the Fairy Forest. You also talked me out of staring a war with Dwargon over my unjust capture. I am kind of impressed you two are like a couple of fresh diplomats," she said calmly. "And you can drink three mugs of Dwarven Ale which means you are a couple of champions!" she commented as if this was the most important thing. Whatever the case was with this Fairy Queen she had a very different approach to everything than anyone else. 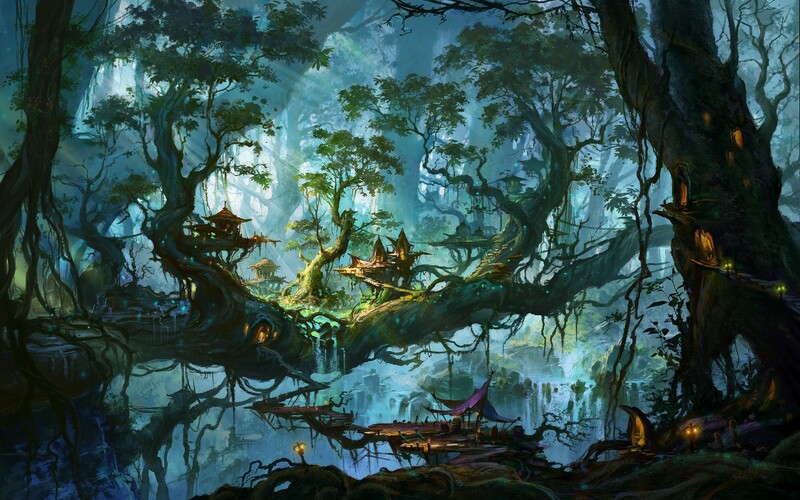 Dakini was right; the Fairy Forest was an incredible change of pace compared to Dwargon. He still couldn't quite put words to what he was witnessing, but he followed behind the queen regardless. In the time it took them to make the journey, Miki shared with Kou a bit of information regarding the man who trained her in Runes. She made it clear that he reminded her of a character from another video game, and he was quite surprised to hear the reference. "You mean Arngeir? That's crazy!" he replied with wide eyes. "You know, I killed Paarthurnax back when I thought it was mandatory, and I didn't like the way those guys reacted. So.. I attacked them. Didn't work out. I spent about ten minutes thinking my game was bugged because of how long they kept me frozen." Kou took this moment to explain a random occurrence he had within the game referenced by Miki, thinking it to be a funny memory. Moments later, the Adventurers were left standing before Dakini as she took her throne. Her assessment of their completed tasks was empowering, though it was strange how much she credited them for their drinking ability in the end. "Ano... I'm not sure what to say to that. I don't think we stopped a war though. I don't know why, but... something about that didn't feel right. Either way, helping out was worth it in the end." The story Kou shared about the other video game Miki referenced made her eyes widen. She couldn't imagine doing something like that, and she'd always felt like the Greybeards weren't worth challenging. She'd gone about that whole scenario in a different way but she could easily understand how it happened. A small giggle escaped her as she considered how funny it would be to think your game bugged because of the overpowered enemy you encountered. "Sou ka... that's pretty funny. I never did it that way. I made a save specifically for that... and then reloaded an old one when I was trophy hunting. I wasn't ever really about how 'mercenary-like' the Blades were. They always seemed a bit too black and white for the issues of grey presented by what was going on..." she explained. But it seemed to be just the type of person Miki was in the end. Of course, as they made their way to the throne room their hushed whispers would die down and they'd be addressed directly by the Fairy Queen. Her words to them were a bit strange, but Kou's response was equally as strange. "Oh? Well, even if something didn't feel right, you acted when others couldn't and saved lives which is commendable. Besides... I am sure you two aren't the type to leave people hanging when you help out... so don't let that nagging sensation bother you too much, move forward, even if it take you back around again!~" Dakini's words were strange but they fit with what Miki had so recently learned about nature. "I'll consider your quest complete. I'm also in work to complete a bit of a peace treaty with the Dwarves so we don't have any more problems... and you two helped out with that quite a bit. So tell me, want can I give my heros in exchange for their good works?" she asked of the pair, both of them receiving the golden light of experience as they pushed towards level 27 with their completion of the quest. She could offer them no less than what they'd been offered in Dwargon, lest she be considered a bad host. And once again Miki spoke up because her weapon was the reason they'd come here. "I need Sacred Tree Sap. It's all I really require... I can't speak for Kou though..." she said with a firm nod leaving the lad to decide what he wanted. Dakini's left brow rose, but the girl's request could be satsified with a few stipulations. "And you?" Dakini said looking to Kou knowing that there would be an interesting explanation coming about Miki's request. "It all worked out fine. I made a save right before I attacked Paarthurnax, so I was gonna reset the game anyway. I just wanted to see how the Greybeards would react," Kou explained. With that, they were before the queen and receiving their commendations. From Kou's standpoint, he could say she was right about the inability to leave others behind when they legitimately need help. Still, there was something else bothersome about the idea that the Lizardmen sought war with Dwargon. This didn't matter much now since they had been stopped regardless, so Kou took Dakini's advice and didn't commit much worry to it. The topic was soon brought to the Adventurers' reward as they received their experience bonus for the completed quest, and Miki brought up her desire for Sacred Tree Sap. Kou was also asked what he desired, though he hadn't actually considered getting something from the Fairy Forest in the first place. "Uhh... well..." he said, obviously at a loss initially. His mind raced toward an answer, taking in all he knew about the lore of Age of Eternity before a moment of realization struck him. When this happened, he looked to Dakini with confidence radiating through his answer. "Got it. I want the Fairy Queen's blessing." Apparently the lad played the game of testing limits when it came to the adventure they were discussing. She could see doing something like that just to see what would happen, though it wasn't necessarily in her nature to do the same. "Hai hai... as long as it worked out~" she said happily. Regardless they moved right along their requests were made to the Fairy Queen and what Miki asked for was something which required an explanation, and what the other lad asked for would surprisingly lead the pair along the same journey. "Alright if you seek the Sap of the Sacred Tree..." she said looking to Miki. "And you the Fairy Queen's Blessing..." she said looking to Kou with firmness in those emerald green eyes of hers. "Both of you must visit the Sacred Tree. The Guardian there will be able to be more direct about what you need. Fairies do not confer blessings without trials, even to those would could potentially belong among us..." she said. "We obviously can't accept pansies just for the sake of doing it..." there was a scoff after this and a small flowery sprite managed to look dejected. "Well not you Pansy. It's a saying..." she said reaching out to the little spirit to comfort it. "The road is treacherous though and I cannot guide you. If you undertake such an adventure both of you should find what you seek," she said calmly. "Sou ka. Point us in the right direction then?" asked Miki. The fairy queen stood and pointed in a direction, golden dust fluttered from the tips of her fingers and towards the depth of the forest. "Arigatou Gouzaimasu~" Miki said finding it easy to turn on her heels and go. "Oi! If you make it back... you can stay here for the night... we're not Dwarves but fairies are still pretty good for a party!~" mentioned Dakini as the pair would be left to their own devices. Both of the Adventurers would have their desires met after just one more journey. Luckily, Dakini noted that they would both find what they sought at the same location, from the Sacred Tree's guardian. She was courteous enough to point the way and light their path, even as she mentioned that it was a treacherous one. "Guardian of the Sacred Tree, huh? Alright, another quest won't hurt," he said as he began moving. He walked alongside Miki, looking over his shoulder only when Dakini offered for them to stay the night in the forest if they managed to return. He replied with only a wave over his shoulder, and continued about his business down whatever path lay ahead of Miki and himself. Golden dust glittered along the path they should take, and this was interesting in an of itself. The path they took would lead into the depths of the forest that the would have to aim to traverse in order to make their way to the Sacred Tree at the center. As they walked along, they'd be lead to something which looked like high hedges dangling over a rapidly flowing river. This opened up to show a vine covered path with various branches and roots taking place and as Miki looked this over her eyes widened slightly. "Sou ka, it looks a bit like a Labyrinth..." she murmured looking it over she didn't take a step forward, nor one backward. All of it seemed a bit dangerous and the glow of fairy dust disappeared in the space. "If we go in, we actually have to make our way through it. I assume the Sacred Tree is in the middle though... that's usually how these moments play out right?" she mused aloud. Unlike the other places, this area was dense with mana and not necessarily navigable by mana sensory methods. It would actually require the ability to navigate the maze as it was intended, which would explain why Dakini said the road was treacherous and that she couldn't guide them. When they finally reached their destination - or rather, the true beginning of their venture - the pair stopped. Miki likened this place to a labyrinth, triggering a specific train of thought in Kou. She further deduced that the Sacred Tree was most likely in the center of this labyrinth, which Kou knew to be an accurate assumption to make based on normal puzzles such as this. "Labyrinth... I wonder if we'll find David Bowie," he said slightly in jest. "This tree is something really important. It only makes sense to not put it at one end, so it's definitely on the inside. It's a big deal though... so this would be a weak puzzle if they put it in the exact center. No, this has to be way better than that," the lad continued, stepping forward to the maze's opening. "Can't be too difficult, unless there are death traps. There are probably death traps, like in the ones they put in video games. Y'know, like Pitfall. Right..." As he took a moment of pause in the middle of his statement, Kou slapped his cheeks and grinned. "Puzzle time!" Without further ado, Kou entered the labyrinth. As he took measured steps forward, he seemed to have his focus on the sky instead of the path ahead. He would go on to skip the first two potential turns, and instead take the next turn to the right.